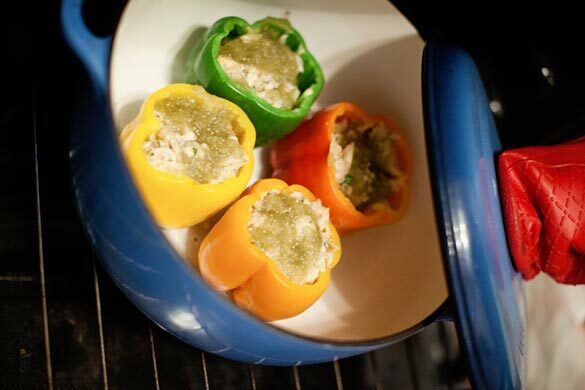 Today’s Cheesy Chicken Enchilada Stuffed Peppers recipe and post is from Brandi Koskie with photos by Kacy Meinecke. I am an all out Mexican food fanatic. On a trip to SXSW in Austin once, I had Mexican food for seven consecutive meals. So when I say “I could eat it every day,” I truly mean it. I’ve done it. Look away from the fast-food abomination, and this corner of the ethnic food map is full of fresh, healthful foods. Beans, corn, peppers, avocados, chicken, tomatoes — really, what’s not to love? It’s when we fry it, drench it in cheese and load it in fatty meats that we really do this menu a nutritional injustice. I like to think my enchiladas are the exception to this rule. 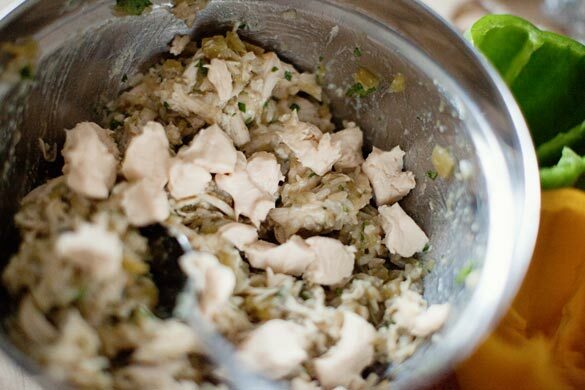 Lean chicken, green sauces and a little cheese all rolled inside whole-grain tortillas — that’s a winner of a chicken dinner at my house. But to really bulk them up I had to turn to peppers. 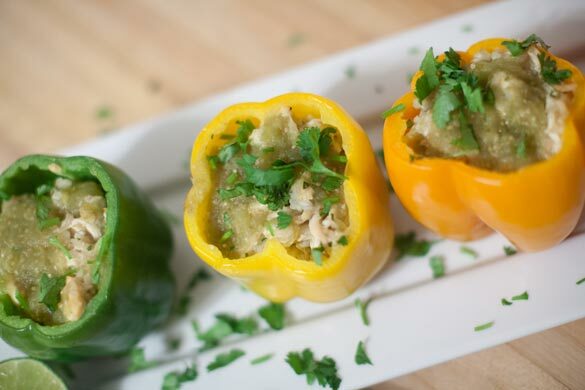 Stuffed peppers are such a great meal. 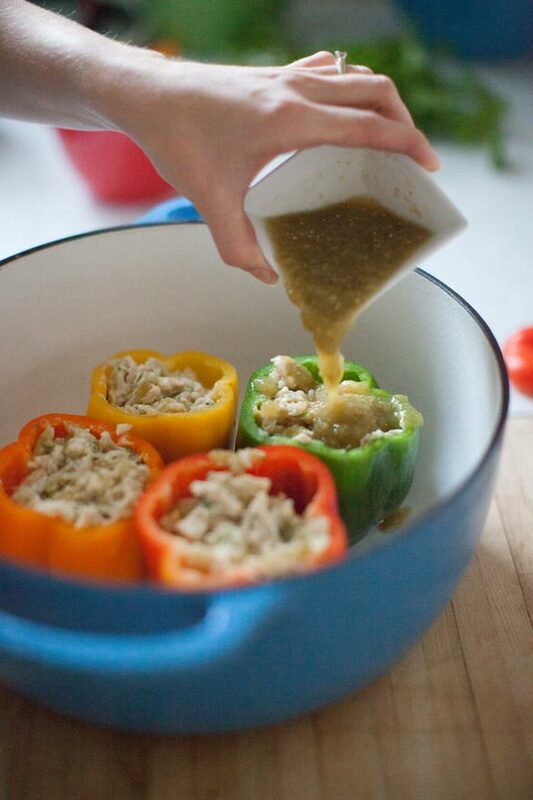 Generally they’re very easy to prep and the slow cooker fits them in to almost any schedule. I am obsessed with my Dutch oven, so that’s what I used. A shallow glass dish in the oven works, too. I’d say, all cooking methods short of nuking them are probably going to yield an edible result! Enchiladas aren’t generally heavy on the veggies, but when the enchiladas bake inside the veggie, you’ve got no excuse to skip it at your meal. And when you get so full, as you are wont to do with enchiladas, you’ll know that’s mostly the bell peppers. No one can fault you for that! 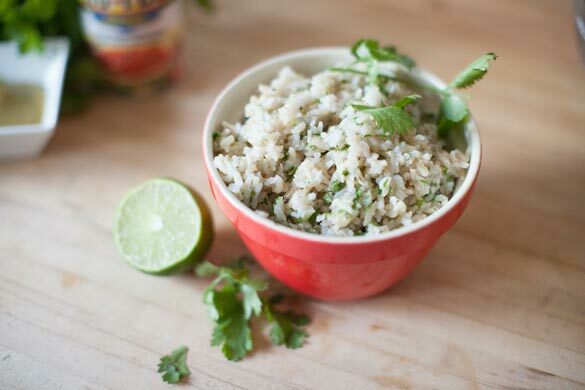 Whip up a simple brown rice with cilantro and lime. Grill or roast your own chicken, or feel free to buy a roasted chicken from the deli to save time. Mix with your favorite green chili sauces. And make ‘em all gooey and cheesy with some of Laughing Cow’s Queso Fresco and Chipotle. One fully stuffed, totally loaded enchilada pepper will run 291 calories and 4.4 grams of fat! 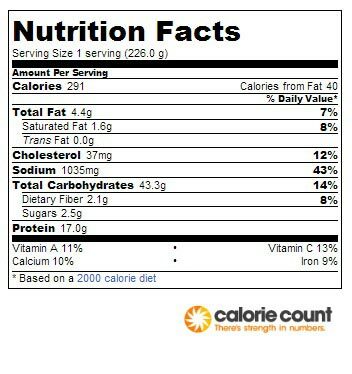 The green chili chicken enchiladas with rice at On the Border runs 850 calories and 34 grams of fat. This is a bargain worth sinking your teeth into! 1. Prepare rice to package instructions. Then, in a large mixing bowl, combine the rice with cilantro, lime, and salt and stir to combine. 2. Heat oven to 400 degrees. 4. Add the chilis, green sauce, and cheese. Fold all of the ingredients together. 5. Rinse the peppers, then slice off the tops, and clean out the seeds. Then, fill the peppers with the chicken and rice mixture. Top each pepper with the salsa. 6. Place the stuffed peppers inside a Dutch oven and bake for about 30 minutes.